Welcome to Day Five of the First Annual Virtual Craft Show! 7 Days, 70 Artists, GIVING AWAY 70 things. Visit Day One, Two, Three, and Four by clicking each number! I hope you'll take the time to visit these artisans' shops and blogs, too. Be sure to have either a blog with an email contact, or leave an email in your comment so I can notify you! Drawing will be held a couple of days after the show. Now here are the first lovely artisans! 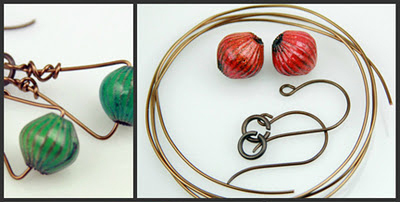 These are adorable little beaded, copper wire jewelry for your plants. 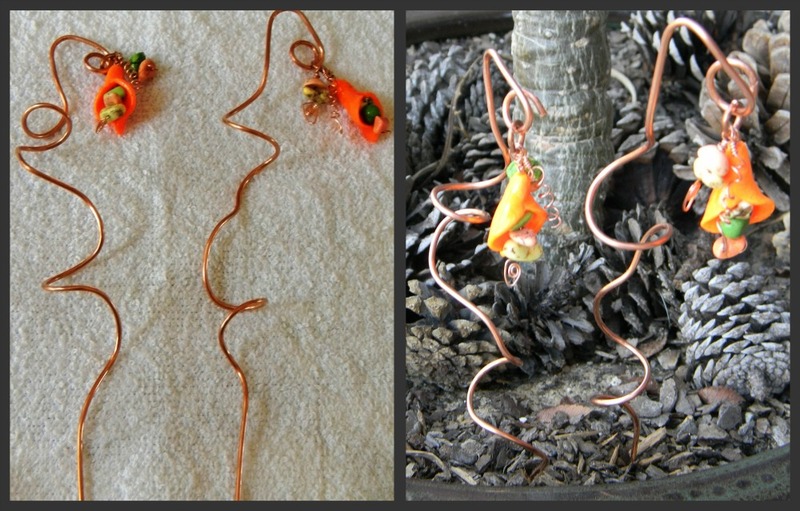 They’re made with copper wire and have a yellow and orange polymer clay lily flower attached to them. The flower is dressed up with orange, yellow and green dyed howlite beads strung on copper wire. There’s a copper wire tendril attached to finish them off. They hang from a loop on the wire stake and can be put in your plant pots to dress/accessorize them. They are about 8" tall. "DIY Autumn Harvest Earring Kit"
* 2 torch fired (by me) metal enameled beads in your choice of color. Use code virtualcraftshow20 for 20% off anything in my etsy shop or website. Always free shipping to the US and Canada. All international is free on my website. 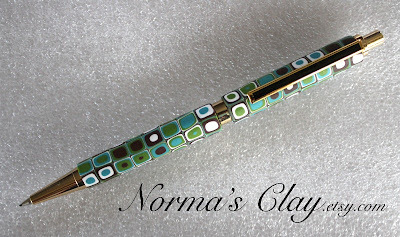 I'm giving away this Polymer Clay Green Retro Mechanical Pencil made by me. Metal finishes are 24k gold plated. It uses .7mm leads (2 provided). A beveled glass cabochon protects a striking art print, featuring two birds in a tree. With its bare branches, the tree makes me think of the isolation of winter, made so much easier by the companions we keep by our sides during the dark and gloomy times. Seed bead embroidery in turquoise and black surround the bevel, with the neckpiece of dyed turquoise howlite rondelles and glass millefiori beads. -A primrose pendant in orange and turquoise (one of the beads inspired by the Ophelia ABS challenge). 1 inch diameter, distressed and with a custom patina, this bead is one of my most popular items. - 5 of my lentil beads in orange and turquoise. 5/8 inch in diameter. Layers of millefiori canes create beads that can support and add detail to a design or stand alone. -5 disk bead in orange and turquoise.1/4 inch wide and ranging in diameter from 3/8-1/2 inch, these beads make wonderful accents. -38 inches of coordinating sari silk. 20% off all merchandise during the event (coupon code VCS20). I got inspired to make this necklace when i saw these pretty greenish blue oval crystals sitting in a bowl along side with the rondelles which are two toned. The light blue Czech crystal pearls match wonderful with the Chinese crystal oval. 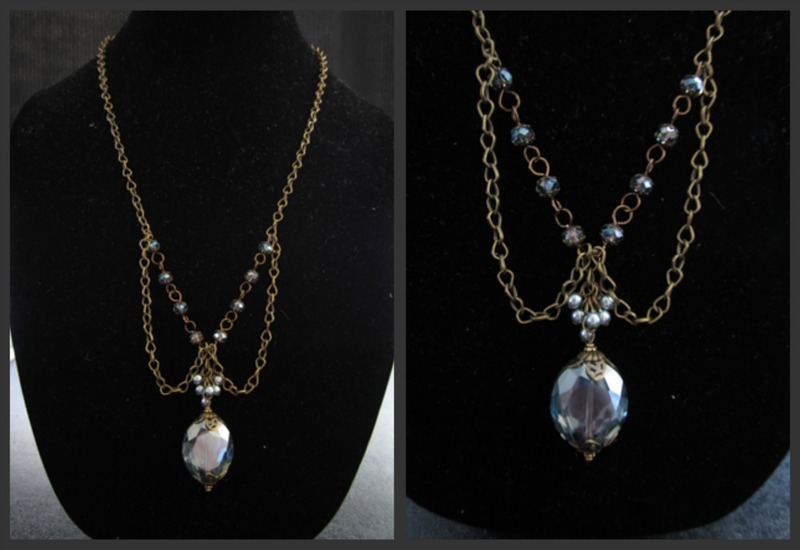 I love it with antique brass chain and bead caps. The chain drapes beautifully on the neck. Looks great with almost everything. Use the patterns and colors on the box to inspire a unique jewelry design. Kit includes 75+ beads (not including seed beads), plus 24" of silver-plated chain. The types of beads in the kit include vintage Lucite, gemstones, shell, glass, pearls, crystals, and filigree. Kit also include a small tube of seed beads and pewter snowflake charms. This is a one-of-a-kind kit created from my personal bead stash. There are no instructions or patterns included; use your imagination to make something wonderful! A beautiful natural brass byzantine bracelet that has been paired with a lovely copper blank that has been filled with crystal clay and accented with Swarovski crystals in an amber mix. The size of the bracelet 7.5" and will come gift wrapped for you or that special someone. 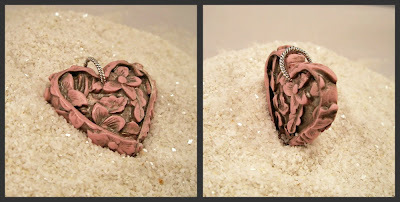 This floral embossed heart is made from a custom blended pink polymer, then pressed into my proprietary mold of a bit of vintage carved plastic. The detailed strip that frames it is added after the shape is cut out. It is baked, and then colored by hand with a wax-based patina. The back is fully finished as well. This one needed no glaze, I simply sanded and buffed it to a shine. There is large fancy jump ring embedded in the center, all ready for you to use in your creations, or put on your favorite chain, cord, or ribbon. It would look great with a simple black velvet ribbon, or any silver chain, or used as a focal for one of your own beaded or mixed media masterpieces! It measures 1.5" wide by 1.5" tall by 1.5" in depth. 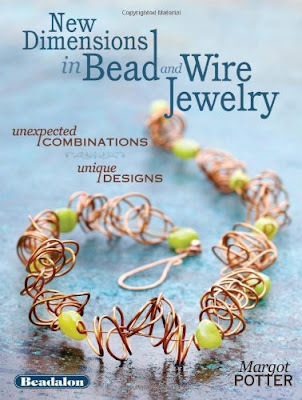 Margot Potter's brand new book full of truly unique beading ideas! Brand new and ready for you to dig into and get your bead on! Day Five and more giveaways! Another day of such lovely things! This has been so much fun! Back again to check out today's group of talented people. I will be checking out their pages. Each day brings more delight to the eye! Amazing! Good orning, Lori! What a great selection of artists again today! Just wanted you to know I blogged about this again today, and my blg is posted on FB, too. Thanks for doing this. I can't believe it. This gets better and better! Such talent! Woohoo! Today's my day. Sold my birdfeeder that was featured in the Birds&Blooms magazine last night from that feature. So hoping for more sales today from this. Blogged about the show and giveaways, plus a color challenge I'm in. Just tweeted about the show and giveaways. Posted on my facebook page and in my facebook group page. Once again our wonderful artists come through. Beautiful selection of gifts today. Hope I'm a winner! Wow, there's so much amazing stuff here, even some interesting non-beady stuff! wow another day of beautiful things! I love the byzantine bracelet and the pink heart. Beautiful! Good morning Lori, wow day 5 of the Virtual Craft Show and like all of the previous days the artist are amazing. I have ran out of mad money, but I have been marking favorites to come back later to purchase. Best wishes to you and I hope you get lots of sales you have some beautiful pieces in your shop. Thank you Lori. Everyday is just amazing. I FB'd. Love the princess necklace, and the variation! Oh Lori how you pull artist together is amazing. What a great show today! Wonderful items! 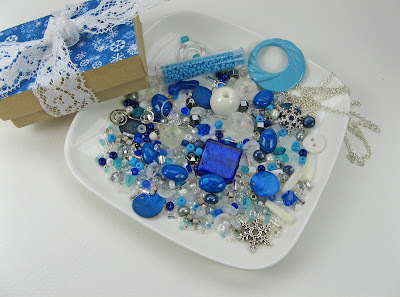 I especially would love a chance at the Winter Wonderland Beading Inspiration Kit! Another amazing day! What amazing prizes!! Another gorgeous group of giveaways. Thanks for hosting Lori. Love, love love the work of the magnificent artists. Staci Louise's pendants are wonderful. I blogged about today's blog post. Super items! I especially love the heart pendant and the Byzantine Bracelet. Lovely things to see and drool over. Thanks for hosting. Wow, those plant stakes are so charming! Pot charmers. HA! What a cute idea! Wow! What fun this all is! wow, such a cool assortment of stuff! Hey Lori I have been to all the booths thid morning Wow what talent. Hi I just created a tresury and blogged about the show http://www.etsy.com/treasury/NTM3MDA2MHwxMzE0MjA1NTYw/virtual-craft-show-a-touch-of-red, will fb and tweet too. I really like Michelle Mach's kit - lots of beady fun. More great stuff once again! Love the art beads, the pen, the jewelry...love it all! I just sent another tweet too! Thanks for the chances to win! So honored to be included in this line-up, wonderful show. Thank you very much Lori!! Another great group and a book I hadn't heard of! You can never have too many bead and jewelry books. Just tweeted! There are lots of them when you search prettythingsblog. Way to go! Added a post on Facebook. What an amazing Day 5 of the Fair. All of the featured artists are amazing just like all the previous ones. I have tried to connect with each of them and still have just a few more to go. Thank you again for this. I have blogged,tweeted and posted to Facebook. Can't wait till tomorrow. Wow! This is so awesome of you to put this together. I will share for sure. Great stuff. Would love that book by Margot. She is my crafting hero. I Facebooked the link to my day! Day five is just as fabulous as all the rest, plus YOU are included in this day!! Yay Lori! Another day of fabulous items. So much creativity on show. More wonderful things to see! an amazing asortment of goodies, all these artist are just amazing! Another great day! The pen is cool. Off to share! Turquoise and orange. I am loving it both in the necklace and the beads. Some really generous prizes. I can't get over the wonderful eclecticism of the show every day! Wow, wow, wow! Love all the artists featured today! Beautiful work. Have just posted on Facebook! Another day of great artisans and what great giveaways. It is so hard to just coose one item per day for my wish list. Thank you again and the vendors that are donating their products. I'm finding these last few days so fun! For some reason, I was expecting only jewelry--like that's the only craft there is! Ha! It's nice to see what others are doing too! Preparing that blog post is on my agenda for tonight. Should go out tomorrow morning! Thanks for another day of fabulous eye candy!!! Love the Byzantine Bracelet and the Skylar Bre'z with tree and birds. Very interesting and creative pieces. More amazing pieces - the pen is so fun!! This is so much fun! Love seeing what surprises show up each day and learning about new artists! Amazing colors in this group! beautiful things once again! thanks! .... stunning! I love todays showcase!! More wonderful items! This is a great way to finish up my Christmas shopping! the pencils is unreal I mean amazing. Please enter me! I love looking at all the items made by these talented people. That pen, mught actually get me to writing all those notes to friends that I've been slacking on. What a creative idea. All the items are wonderful. loving all the eye candy! keep it up! I absolutely love these things . So many cool designs. I hope I win! I love the byzantine bracelet here! catching up ... each day is so full of pretty things! So many beautiful things! 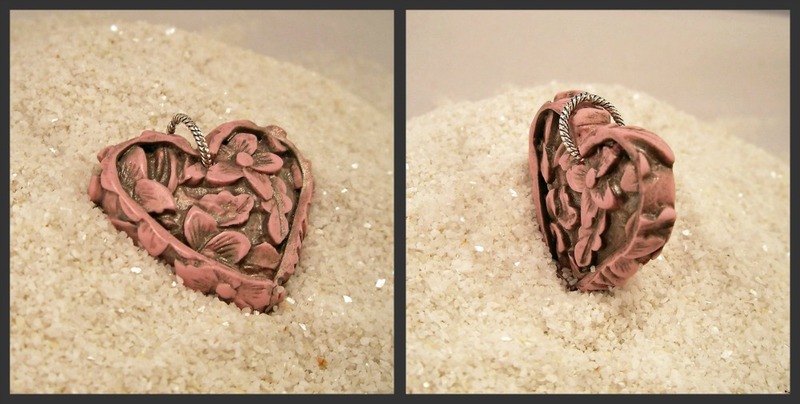 I'm amazed by the amount of gorgeous - and different - polymer clay there is going on. Penny's bracelet is particularly lovely! I need all weekend to see all these in detail!! That pencil would make doing homework fun. Not that I do homework any more! But you know what I mean. Oooooh! What beautiful things! Manuela's pendant is so beautiful. Pretty, pretty pretty! Love Manuela's pendant, Claire Maunsell creations and everything else! amazing pieces! i would love to write with one of those pencils! Just when you think the giveaways can't get any better... you go and post these artists! LOL Seriously Lori, what talent you attracted for this giveaway. Beautiful works! Wow! Again great choices. That pencil is great! Beautiful things. What a wonderful fair. I'm really impressed by Art Bead Bundle (turquoise & orange) and Winter Wonderland. wow! the book looks very interesting! LOVE Kay Thomerson's pot stakes! This is what thanks is all about. Want Bead Soup Blog Party goodies?